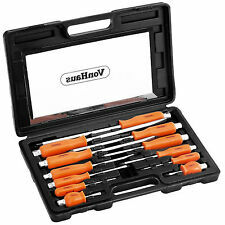 12 Piece Engineers Screwdriver Box Set (Hex Bolsters for Maximum Torque). Hex Bolsters - jointed with the blade to add extra torque. Each impact driver has a hex bolstered seamless handle and magnetized blades. 10pc Pozi: PZ0 x 2, PZ1 x 2, PZ2 x 3, PZ3 x 3. 10pc Torx: T10, T15, T20, x 2, T25 x 2, T27, T30, T35, T40. 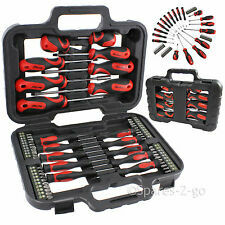 18 Piece magnetic screwdriver set with 40 piece assorted bits in plastic blow molded storage case includes a range of popular sized high quality screwdrivers. 3/8" Dr. reversible ratchet handle. Complete with blow moulded storage case. 1/4"(m) x 3/8"(f) adaptor. 13/16" Dr. x 21mm spark plug socket. 3/8" Dr. 75mm extension bar. 12 x 1/4" Dr. sockets AF Size 5/32, 3/16, 7/32, 1/4, 9/32, 5/16, 11/32, 3/8, 13/32, 7/16, 15/32, 1/2". 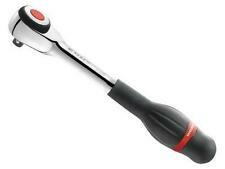 Draper 64535 3001A/BK Special Edition 1/2" Square Drive 30 - 210Nm or 22.1 - 154.9lb-ft Ratchet Torque Wrench. It has a range from 30 - 210Nm (22.1 - 154.9lb-ft). Marked range: 30 - 210Nm or 22.1 - 154.9lb-ft.
Draper 64534 3004A/BK Special Edition 3/8" Square Drive 10 - 80Nm or 88.5-708in-lb Ratchet Torque Wrench. It has a range from 10 - 80Nm (88.5 - 708in-lb). Marked range: 10 - 80Nm and 88.5-708in-lb. Reversible ratchet head. These Torque Wrenches give more of a Feeling a Nudge. Heat treated steel ratchet head. Ratcheting Torque Wrench 1/2" Socket square drive with Extension And Sockets UKT. This wrench is a quality tool which is suitable for professionals and DIY motor. Pressure Washers. Tile & Grout Adhesives. Space Heaters. Screwdriver Bits / Adaptors. Weedkiller, Lawn Feed & Seed. Mitre, Site & Table saws. Sanding - Flap Discs. Impact Drivers & Wrenches. 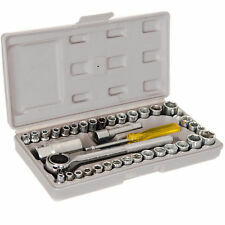 1 x 12 Piece Flexible Head Ratchet Spanner Set. Fitness, Running & Yoga. Computers& Network Hardware. Hair Care & Styling. Automation, Motors & Drives. Motorcycle Parts. Body Jewellery. 180-degree flexible head to ensure extended versatility, particularly in hard to reach place. 3 Draper TX Star screwdrivers: T8 x 75mm, T10 x 100mm and T15 x 100mm. 4 x 1/4" Draper TX-STAR bits: T7, T8, T9, and T10. Draper TX-STAR products are compatible with †Torx fixing systems. 8pc imperial hex keys: 1/16", 5/64", 3/32", 1/8", 5/32", 3/16", 7/32", 1/4". Combination spanner so one end is open and the other is a ring spanner. 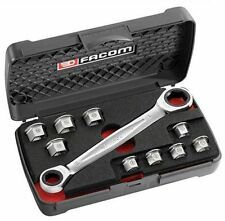 AF / Imperial / Sae spanner set. 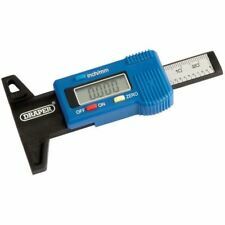 Bi-hex 12 sided ring spanner for greater leverage and less chance of slipping when using. SET INCLUDES THE FOLLOWING. CHROME VANADIUM - ALL SIZES MENTIONED ON THE HEADS! Each torque wrench is supplied in sturdy and robust blow mould case for safekeeping. Ideal torque wrench for any toolbox. Wrench Socket Bits: 2.5mm, 3mm, 4mm, 5mm, 6mm, 8mm, 10mm / T25 T30. 9 x Wrench Socket Bits. 1 x 1/4" Torque Wrench. Torque: 0.63cm/0.25"(1/4"). - Tolerance of torque /-4%. - Wide range of choice. - Quick release design. Torx: T5 x 40mm, T6 x 40mm, T7 x 40mm, T8 x 40mm, T9 x 40mm, T10 x 40mm. 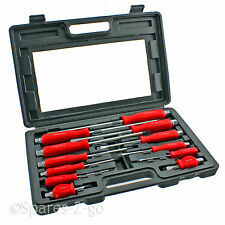 18 Piece magnetic wall mountable screwdriver set includes a range of popular sized high quality screwdrivers. Fitted with shaped soft grip ergonomic handles for a comfortable hold. Set of 8 Whitworth Spanners. Sizes (Whitworth). 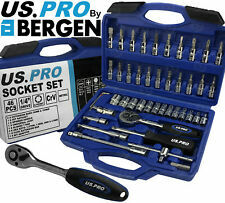 Impact screwdriver and bits set suitable for deals with many types of screws and bolts. 1 × 14pcs Impact Screwdriver with Bits Set. Flat blade 5mm(total length 35mm). Flat blade 6mm (total length 35mm). 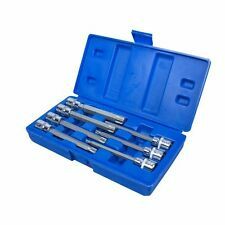 12 pcs double ended combination ratchet wrench set - open ended and flex-ratchet ring heads. 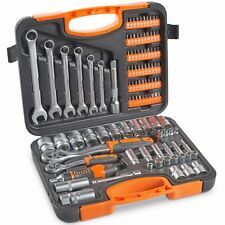 12x Ratchet Wrenches. This does not influence your statutory rights. We will then issue you with a RMA number for reference and that should be quoted on all future correspondence. 3PC Professional Steel Quick Release Ratchet Handle Set 1/4" 3/8" 1/2" 09/10/11! A 3 piece quick release 24 teeth ratchet set. The set includes a 1/2", 3/8" & 1/4" drive ratchet. The ratchets feature an soft grip handle for added comfort and less slippage. The perfect ratchet set for your toolbox. Draper Expert Lifetime Warranty - Over 5,400 Sets Sold! 9 Pc 1/4", 3/8" & 1/2" Dr Impact Extension Bar Set. 9pc Impact Extension Bar Set 1/4" 3/8" 1/2" Drive. • Heat Treated. Suitable for use with 1/4", 3/8" and 1/2" drive ratchets. • Drop Forged. • 1/4" Drive: 50mm 2", - 100mm 4" and - 150mm 6" Approx. Brake discs Range: 0mm - 33mm. Storage temperature: -20°C ~ 40°C. Hand Tools. Cordless Power Tools. Corded Power Tools. Compressors & Air Tools. 6 Point Sockets Higher Torque. Robust Carry Case Specifications Garage & Automotive. 18 x 1/2" Drive Sockets: 10mm, 11mm, 12mm, 13mm, 14mm, 15mm, 16mm, 17mm, 18mm, 19mm, 20mm, 21mm, 22mm, 23mm, 24mm, 27mm, 30mm & 32mm. 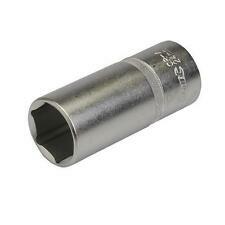 4 x 1/2" Drive Deep Sockets: 14mm, 15mm, 17mm & 19m. 13 x 1/4" Drive Sockets: 4mm, 4.5mm, 5mm, 5.5mm, 6mm, 7mm, 8mm, 9mm, 10mm, 11mm, 12mm, 13mm & 14mm. Professional, branded Ratchet with 3/8" Drive. This is more suited to the professional who appreciates quality, professionals such as motor mechanics. A great alternative to Snap-On-Tools or should we say Rip-Off-Tools? Quick release centre button. 3/8" Square drive. 72 Teeth Ratchet. 200mm long (20cm). Made to last. Brand: Hilka Pro-Craft. . Combination spanner so one end is open and the other is a ring spanner. Imperial spanner set. IMPERIAL 1/4", 5/16", 3/8", 7/16", 1/2", 9/16", 5/8", 11/16", 3/4", 13/16", 7/8" And 1". SET Includes; SIZES. 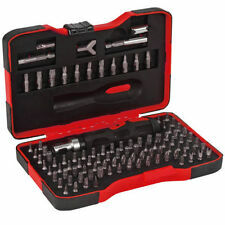 Sockets: 13 x sockets: 4, 4.5, 5, 5.5, 6, 7, 8, 9, 10, 11, 12, 13 and 14mm; 3 x slotted screwdriver sockets: 4, 5.5 and 6.5mm; 3 x PZD screwdriver sockets: Nos 1, 2 and 3; 7x Trx screwdriver sockets: T10, T15, T20, T25, T27, T30 and T40; 7 x Hex key sockets: 2.5, 3, 4, 5, 6, 8 and 10mm. 2 x PZ TYPE Bits - No.2 and No.3. Draper Impact Screwdriver Set With Case. Draper Expert range is our benchmark for quality. PZ TYPE Insert Bits Are Compatible With Pozidriv/Supadriv Fixing Systems. CHROME VANADIUM - UK STOCK! RETAIL PACKAGED!